Dunwoody, GA, November 27, 2018 - Solarize Dunwoody, a program to make it easier and more affordable for Dunwoody residents to go solar, is wrapping up a successful campaign with 52 solar installations for a total of 328kW of solar capacity and 404 kWh of battery storage. This represents a 600% increase in solar installations in the area. “We had over 275 people sign up for a free solar evaluation, which demonstrates strong interest in clean energy,” said Tina Wilkinson, Solarize Dunwoody Chairperson. 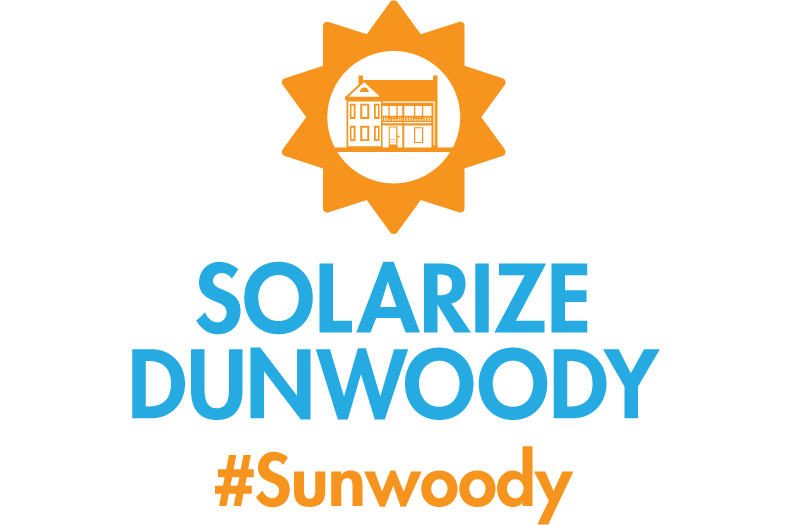 Dunwoody was the fifth Solarize program in Georgia and is being followed by Solarize programs in Carrollton, Atlanta, Newton & Morgan counties, Middle Georgia, and Roswell. Solarize Dunwoody is giving back to the community by donating a 10kW solar array to the Community Assistance Center (CAC) in Sandy Springs. The CAC helps residents of Dunwoody & Sandy Springs facing emergency situations meet the basic needs of food, shelter, and clothing. CAC also promotes longer term goals of self-sufficiency through adult education and referrals. ”CAC really appreciates this gift from Solarize Dunwoody which will reduce our electric bill by over $2,000 annually. These savings will allow CAC to provide more benefits to our fellow residents in Sandy Springs and Dunwoody, doubling the positive impact on the community by bringing stability to families and helping the environment.at the same time,” said Charles Crosby, CAC Board of Directors. Members of the Solarize Dunwoody coalition agreed that a solar installation would have the biggest impact at the CAC’s Roswell Road location, which houses a food pantry and thrift store, reducing power bills and freeing funds that can be used to fund CAC core mission initiatives. The donated solar installation is funded by Solarize Dunwoody partners Hannah Solar and Solar Crowdsource. The Solarize coalition also includes partners from Dunwoody Sustainability Committee, UMC Earthkeepers, Dunwoody Homeowners Association, Environment Georgia, and Georgia Interfaith Power & Light. “Hannah Solar would like to thank Solar Crowdsource and the Dunwoody community for allowing us to participate in this campaign. We look forward to building upon the success of the Solarize Dunwoody program and promoting energy independence for residents across the state of Georgia. Hannah Solar is pleased to provide this contribution to the CAC in recognition of the achievements of Solarize Dunwoody,” said Joseph Waybright, VP of Residential Sales at Hannah Solar. Don Moreland of Solar Crowdsource noted, “We expect the CAC will save at least 10% on its electricity costs for decades to come.” Additionally, this donated system can provide education to the wider community about the benefits of using solar right here in Georgia. “Solarize Dunwoody has been a successful community-led venture, with one of its biggest accomplishments being able to provide a complete solar system to a worthwhile nonprofit. This donation will help reduce operating costs for the CAC and allow them to do even more for our neighbors in need,” said Rev. Kate McGregor Mosley, coalition partner and executive director of Georgia Interfaith Power & Light. The donated solar array is being designed and is expected to be installed at the CAC in early 2019. For additional information contact Tina Wilkinson, tinaw@wilkinsons.com, 404.216.9505.